The first time I saw him, he was running down Troost Ave. 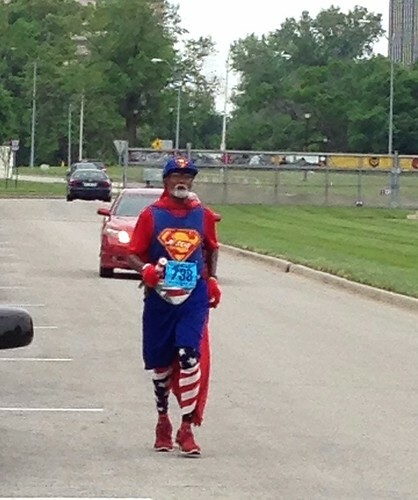 It was one of those sites that made me do a double take and think "wait...did I really just see an old black man dressed as Superman running down the street?". I would see him again in other areas of the city. Sometimes he'd be running along Main Street and sometimes he'd be carrying an American flag. When Michael and I visited the World War I Museum on Memorial Day, he was running laps in the big circle drive of the museum. As I stepped out into the drive to take his picture, he looked at me and said "I'm about to finish up lap number seven.". Later, I read that he calls these "Jericho laps". I wanted to know this man's story. Michael waived the man off as just another weirdo, but I believed there was more here than just plain old kooky. I discovered that our running Superman's name is Michael Wheeler, he's 61 years old, and he's been running for most of his life. He has jogged through every state twice and has been in several marathons, including the Boston Marathon. He says he started running to escape bullies. He was tired of getting beaten up, so he ran. Now, he says he runs for Jesus. He calls himself a running evangelist and he runs six days a week rain or shine, starting in the mornings, breaking for lunch and prayer and finishing his run around 8 pm in the evening. The Superman costume is a fairly recent addition. He only started wearing it the last couple of years. He said that he just gets a kick out of the attention the costume brings him. He's always had a love of Superheros and thought maybe donning a cape would be inspirational. 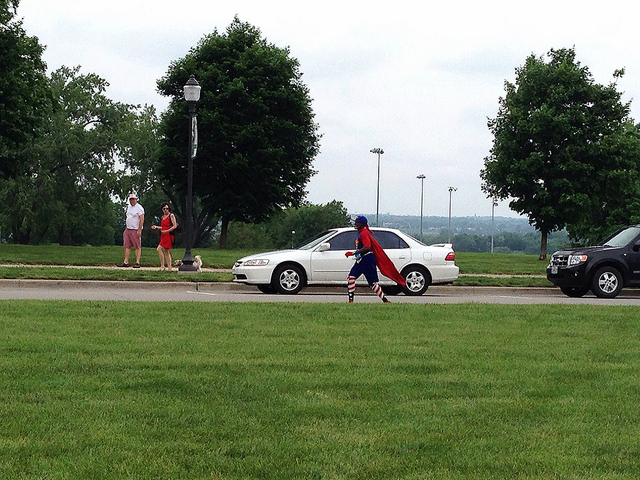 And he admits that the Superman costume gives him a mental boost too. When I started writing this post, I struggled with how I should describe this man. What's the difference between saying "old man" and "old black man"? Why should it matter if the man is black or white? Normally I would say that it doesn't matter at all, except in this case and totally not for any negative reasoning. The Superman emblem brings to mind images of a muscular young white man. Wheeler's choice to use this as his costume says to me that ANYONE can be a Superman. He's telling the world that race and age don't matter and that we all have the potential to be superheros. We all have the potential to inspire and bring hope to others. So, while some people will look at this man, shake their heads and say "crazy weirdo", I will look at this man, raise a fist in the air and say "totally awesome inspirational dude". When I see him running down the sidewalk, I know that the world is going to be a better place that day. Happy Love Thursday Mr. Wheeler.